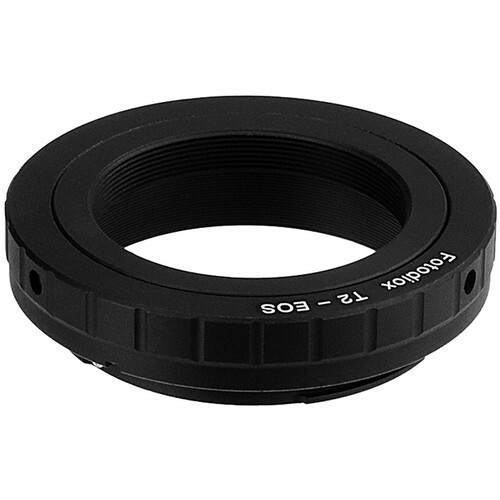 This T-Ring Adapter for Canon EF and EF-S Mounts from Fotodiox is an accessory that lets you mount T2 components to Canon EF and EF-S Mount Cameras. This particular model, the FC10, boasts an enhanced design that includes a focus confirmation chip that allows you to continue using focus confirmation with any attached lens—not just Canon EOS lenses. To open up more creative possibilities by using a wider variety of optics on your camera, connect the T-Ring to the T-Mount-compatible component and then connect that assembly to your camera body. Camera manufacturers make many different camera models and various body mounts so it's advisable to consult your camera's manual to determine your specific model's mount.